The distinct ways of electricity generation can incur significantly different costs. Calculations of these costs can be made at the point of connection to a load or to the electricity grid. The cost is typically given per kilowatt-hour or megawatt-hour. It includes the initial capital, discount rate, as well as the costs of continuous operation, fuel, and maintenance. This type of calculation assists policymakers, researchers and others to guide discussions and decision making. The levelized cost of energy (LCOE) is a measure of a power source that allows comparison of different methods of electricity generation on a consistent basis. It is an economic assessment of the average total cost to build and operate a power-generating asset over its lifetime divided by the total energy output of the asset over that lifetime. The LCOE can also be regarded as the average minimum price at which electricity must be sold in order to break-even over the lifetime of the project. Capital costs (including waste disposal and decommissioning costs for nuclear energy) – tend to be low for fossil fuel power stations; high for wind turbines, solar PV (photovoltaics); very high for waste to energy, wave and tidal, solar thermal, and nuclear. Fuel costs – high for fossil fuel and biomass sources, low for nuclear, and zero for many renewables. Fuel costs can vary somewhat unpredictably over the life of the generating equipment, due to political and other factors. Factors such as the costs of waste (and associated issues) and different insurance costs are not included in the following: Works power, own use or parasitic load – that is, the portion of generated power actually used to run the station's pumps and fans has to be allowed for. Thermally lethargic technologies like coal and nuclear are physically incapable of fast ramping. Capital intensive technologies such as wind, solar, and nuclear are economically disadvantaged unless generating at maximum availability since the LCOE is nearly all sunk-cost capital investment. Intermittent power sources, such as wind and solar, may incur extra costs associated with needing to have storage or backup generation available. At the same time, intermittent sources can be competitive if they are available to produce when demand and prices are highest, such as solar during summertime mid-day peaks seen in hot countries where air conditioning is a major consumer. Despite these time limitations, leveling costs is often a necessary prerequisite for making comparisons on an equal footing before demand profiles are considered, and the levelized-cost metric is widely used for comparing technologies at the margin, where grid implications of new generation can be neglected. Another limitation of the LCOE metric is the influence of energy efficiency and conservation (EEC). EEC has caused the electricity demand of many countries to remain flat or decline. Considering only the LCOE for utility scale plants will tend to maximise generation and risks overestimating required generation due to efficiency, thus "lowballing" their LCOE. For solar systems installed at the point of end use, it is more economical to invest in EEC first, then solar (resulting in a smaller required solar system than what would be needed without the EEC measures). However, designing a solar system on the basis of LCOE would cause the smaller system LCOE to increase (as the energy generation [measured in kWh] drops faster than the system cost [$]). The whole of system life cycle cost should be considered, not just the LCOE of the energy source. LCOE is not as relevant to end-users than other financial considerations such as income, cashflow, mortgage, leases, rent, and electricity bills. Comparing solar investments in relation to these can make it easier for end-users to make a decision, or using cost-benefit calculations "and/or an asset’s capacity value or contribution to peak on a system or circuit level". Typically pricing of electricity from various energy sources may not include all external costs – that is, the costs indirectly borne by society as a whole as a consequence of using that energy source. These may include enabling costs, environmental impacts, usage lifespans, energy storage, recycling costs, or beyond-insurance accident effects. The US Energy Information Administration predicts that coal and gas are set to be continually used to deliver the majority of the world's electricity. This is expected to result in the evacuation of millions of homes in low-lying areas, and an annual cost of hundreds of billions of dollars' worth of property damage. An EU funded research study known as ExternE, or Externalities of Energy, undertaken over the period of 1995 to 2005 found that the cost of producing electricity from coal or oil would double over its present value, and the cost of electricity production from gas would increase by 30% if external costs such as damage to the environment and to human health, from the particulate matter, nitrogen oxides, chromium VI, river water alkalinity, mercury poisoning and arsenic emissions produced by these sources, were taken into account. It was estimated in the study that these external, downstream, fossil fuel costs amount up to 1%–2% of the EU’s entire Gross Domestic Product (GDP), and this was before the external cost of global warming from these sources was even included. Coal has the highest external cost in the EU, and global warming is the largest part of that cost. Depending on the assumptions of possible accidents and their probabilites external costs for nuclear power vary significantly and can reach between 0.2 and 200 ct/kWh. Furthermore, nuclear power is working under an insurance framework that limits or structures accident liabilities in accordance with the Paris convention on nuclear third-party liability, the Brussels supplementary convention, and the Vienna convention on civil liability for nuclear damage and in the U.S. the Price-Anderson Act. It is often argued that this potential shortfall in liability represents an external cost not included in the cost of nuclear electricity; but the cost is small, amounting to about 0.1% of the levelized cost of electricity, according to a CBO study. In November, 2018, Lazard found that not only are utility-scale solar and wind cheaper than fossil fuels, "[i]n some scenarios, alternative energy costs have decreased to the point that they are now at or below the marginal cost of conventional generation." Overall, Lazard found "The low end levelized cost of onshore wind-generated energy is $29/MWh, compared to an average illustrative marginal cost of $36/MWh for coal. The levelized cost of utility-scale solar is nearly identical to the illustrative marginal cost of coal, at $36/MWh. This comparison is accentuated when subsidizing onshore wind and solar, which results in levelized costs of energy of $14/MWh and $32/MWh, respectively. ... The mean levelized cost of energy of utility-scale PV technologies is down approximately 13% from last year and the mean levelized cost of energy of onshore wind has declined almost 7%." The International Renewable Energy Agency (IRENA) released a study based on comprehensive international datasets in January 2018 which projects the fall by 2020 of the kilowatt cost of electricity from utility scale renewable projects such as onshore wind farms to a point equal or below that of electricity from conventional sources. LCOE in AUD per MWh for some coal and wind technologies (2012) from the Australian Technology Assessment (2012), Table 5.2.1. LCOEs by source in Australia in 2012. According to various studies, the cost for wind and solar has dramatically reduced since 2006. For example, the Australian Climate Council states that over the 5 years between 2009–2014 solar costs fell by 75% making them comparable to coal, and are expected to continue dropping over the next 5 years by another 45% from 2014 prices. They also found that wind has been cheaper than coal since 2013, and that coal and gas will become less viable as subsidies are withdrawn and there is the expectation that they will eventually have to pay the costs of pollution. A CO2CRC report, printed on the 27th of November 2015, titled "Wind, solar, coal and gas to reach similar costs by 2030:", provides the following updated situation in Australia. "The updated LCOE analysis finds that in 2015 natural gas combined cycle and supercritical pulverised coal (both black and brown) plants have the lowest LCOEs of the technologies covered in the study. Wind is the lowest cost large-scale renewable energy source, while rooftop solar panels are competitive with retail electricity prices. By 2030 the LCOE ranges of both conventional coal and gas technologies as well as wind and large-scale solar converge to a common range of A$50 to A$100 per megawatt hour." An updated report, posted on the 27th of September 2017, titled "Renewables will be cheaper than coal in the future. Here are the numbers", indicated that a 100% renewables system is competitive with new-build supercritical (ultrasupercritical) coal, which, according to the Jacobs calculations in the report link above, would come in at around A$75(80) per MWh between 2020 and 2050. This projection for supercritical coal is consistent with other studies by the CO2CRC in 2015 (A$80 per MWh) and used by CSIRO in 2017 (A$65-80 per MWh). The International Energy Agency and EDF have estimated for 2011 the following costs. For nuclear power, they include the costs due to new safety investments to upgrade the French nuclear plant after the Fukushima Daiichi nuclear disaster; the cost for those investments is estimated at 4 €/MWh. Concerning solar power, the estimate of 293 €/MWh is for a large plant capable of producing in the range of 50–100 GWh/year located in a favorable location (such as in Southern Europe). For a small household plant that can produce around 3 MWh/year, the cost is between 400 and 700 €/MWh, depending on location. Solar power was by far the most expensive renewable source of electricity among the technologies studied, although increasing efficiency and longer lifespan of photovoltaic panels together with reduced production costs have made this source of energy more competitive since 2011. 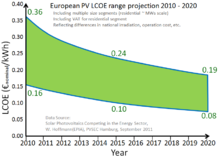 By 2017, the cost of photovoltaic solar power had decreased to less than 50 €/MWh. In November 2013, the Fraunhofer Institute for Solar Energy Systems ISE assessed the levelised generation costs for newly built power plants in the German electricity sector. PV systems reached LCOE between 0.078 and 0.142 Euro/kWh in the third quarter of 2013, depending on the type of power plant (ground-mounted utility-scale or small rooftop solar PV) and average German insolation of 1000 to 1200 kWh/m² per year (GHI). There are no LCOE-figures available for electricity generated by recently built German nuclear power plants as none have been constructed since the late 1980s. An update of the ISE study was published in March 2018. The Institution of Engineers and Shipbuilders in Scotland commissioned a former Director of Operations of the British National Grid, Colin Gibson, to produce a report on generation levelised costs that for the first time would include some of the transmission costs as well as the generation costs. This was published in December 2011. The institution seeks to encourage debate of the issue, and has taken the unusual step among compilers of such studies of publishing a spreadsheet. On 27 February 2015 Vattenfall Vindkraft AS agreed to build the Horns Rev 3 offshore wind farm at a price of 10.31 Eurocent per kWh. This has been quoted as below £100 per MWh. In 2013 in the United Kingdom for a new-to-build nuclear power plant (Hinkley Point C: completion 2023), a feed-in tariff of £92.50/MWh (around 142 USD/MWh) plus compensation for inflation with a running time of 35 years was agreed. The Department for Business, Energy and Industrial Strategy (BEIS) publishes regular estimates of the costs of different electricity generation sources, following on the estimates of the merged Department of Energy and Climate Change (DECC). Levelised cost estimates for new generation projects begun in 2015 are listed in the table below. Since 2010, the US Energy Information Administration (EIA) has published the Annual Energy Outlook (AEO), with yearly LCOE-projections for future utility-scale facilities to be commissioned in about five years' time. In 2015, EIA has been criticized by the Advanced Energy Economy (AEE) Institute after its release of the AEO 2015-report to "consistently underestimate the growth rate of renewable energy, leading to 'misperceptions' about the performance of these resources in the marketplace". AEE points out that the average power purchase agreement (PPA) for wind power was already at $24/MWh in 2013. Likewise, PPA for utility-scale solar PV are seen at current levels of $50–$75/MWh. These figures contrast strongly with EIA's estimated LCOE of $125/MWh (or $114/MWh including subsidies) for solar PV in 2020. The electricity sources which had the most decrease in estimated costs over the period 2010 to 2019 were solar photovoltaic (down 88%), onshore wind (down 71%) and advanced natural gas combined cycle (down 49%). For utility-scale generation put into service in 2040, the EIA estimated in 2015 that there would be further reductions in the constant-dollar cost of concentrated solar power (CSP) (down 18%), solar photovoltaic (down 15%), offshore wind (down 11%), and advanced nuclear (down 7%). The cost of onshore wind was expected to rise slightly (up 2%) by 2040, while natural gas combined cycle electricity was expected to increase 9% to 10% over the period. LCOE data from the California Energy Commission report titled "Estimated Cost of New Renewable and Fossil Generation in California". The model data was calculated for all three classes of developers: merchant, investor-owned utility (IOU), and publicly owned utility (POU). In November 2015, the investment bank Lazard headquartered in New York, published its ninth annual study on the current electricity production costs of photovoltaics in the US compared to conventional power generators. The best large-scale photovoltaic power plants can produce electricity at 50 USD per MWh. The upper limit at 60 USD per MWh. In comparison, coal-fired plants are between 65 USD and $150 per MWh, nuclear power at 97 USD per MWh. Small photovoltaic power plants on roofs of houses are still at 184–300 USD per MWh, but which can do without electricity transport costs. Onshore wind turbines are 32–77 USD per MWh. One drawback is the intermittency of solar and wind power. The study suggests a solution in batteries as a storage, but these are still expensive so far. Lazard's long standing Levelized Cost of Energy (LCOE) report is widely considered and industry benchmark. In 2015 Lazard published its inaugural Levelized Cost of Storage (LCOS) report, which was developed by the investment bank Lazard in collaboration with the energy consulting firm, Enovation. NOTE: ** Battery Storage is no longer include in this report (2015). It has been rolled into its own separate report LCOS 1.0, developed in consultation with Enovation Partners (See charts below). Below are the LCOSs for different battery technologies. This category has traditionally been filled by Diesel Engines. These are "Behind the meter" applications. Below are the LCOSs for different battery technologies. This category has traditionally been filled by Natural Gas Engines. These are "In front of the meter" applications. On December 15, 2016 Lazard released version 10 of their LCOE report and version 2 of their LCOS report. On November 2, 2017 the investment bank Lazard released version 11 of their LCOE report and version 3 of their LCOS report. Below are the unsubsidized LCOSs for different battery technologies for "Behind the Meter" (BTM) applications. Below are the Unsubsidized LCOSs for different battery technologies "Front of the Meter" (FTM) applications. The International Energy Agency and the Nuclear Energy Agency published a joint study in 2015 on LCOE data internationally. In a power purchase agreement in the United States in July 2015 for a period of 20 years of solar power will be paid 3.87 UScent per kilowatt hour (38.7 USD/MWh). The solar system, which produces this solar power, is in Nevada (USA) and has 100 MW capacity. In the spring of 2016 a winning bid of 2.99 US cents per kilowatt-hour of photovoltaic solar energy was achieved for the next (800 MW capacity) phase of the Sheikh Mohammed Bin Rashid solar farm in Dubai. 2 emitted to obtain one unit of exergy rate/flow rate. Photovoltaic prices have fallen from $76.67 per watt in 1977 to nearly $0.23 per watt in August 2017, for crystalline silicon solar cells. This is seen as evidence supporting Swanson's law, which states that solar cell prices fall 20% for every doubling of cumulative shipments. The famous Moore's law calls for a doubling of transistor count every two years. The less solar power costs, the more favorably it compares to conventional power, and the more attractive it becomes to utilities and energy users around the globe. Utility-scale solar power [could in 2011] be delivered in California at prices well below $100/MWh ($0.10/kWh) less than most other peak generators, even those running on low-cost natural gas. Lower solar module costs also stimulate demand from consumer markets where the cost of solar compares very favourably to retail electric rates. In the year 2015, First Solar agreed to supply solar power at 3.87 cents/kWh levelised price from its 100 MW Playa Solar 2 project which is far cheaper than the electricity sale price from conventional electricity generation plants. From January 2015 through May 2016, records have continued to fall quickly, and solar electricity prices, which have reached levels below 3 cents/kWh, continue to fall. In August 2016, Chile announced a new record low contract price to provide solar power for $29.10 per megawatt-hour (MWh). In September 2016, Abu Dhabi announced a new record breaking bid price, promising to provide solar power for $24.2 per MWh In October 2017, Saudi Arabia announced a further low contract price to provide solar power for $17.90 per MWh. With a carbon price of $50/ton (which would raise the price of coal-fired power by 5c/kWh), solar PV is cost-competitive in most locations. The declining price of PV has been reflected in rapidly growing installations, totaling a worldwide cumulative capacity of 297 GW by end 2016. According to some estimates total investment in renewables for 2011 exceeded investment in carbon-based electricity generation. In the case of self consumption, payback time is calculated based on how much electricity is not brought from the grid. Additionally, using PV solar power to charge DC batteries, as used in Plug-in Hybrid Electric Vehicles and Electric Vehicles, leads to greater efficiencies, but higher costs. Traditionally, DC generated electricity from solar PV must be converted to AC for buildings, at an average 10% loss during the conversion. Inverter technology is rapidly improving and current equipment has reached 99% efficiency for small scale residential, while commercial scale three-phase equipment can reach well above 98% efficiency. However, an additional efficiency loss occurs in the transition back to DC for battery driven devices and vehicles, and using various interest rates and energy price changes were calculated to find present values that range from $2,057.13 to $8,213.64 (analysis from 2009). It is also possible to combine solar PV with other technologies to make hybrid systems, which enable more stand alone systems. The calculation of LCOEs becomes more complex, but can be done by aggregating the costs and the energy produced by each component. As for example, PV and cogen and batteries  while reducing energy- and electricity-related greenhouse gas emissions as compared to conventional sources. LCOE of solar thermal power with energy storage which can operate round the clock on demand, has fallen to AU$78/MWh (US$61/MWh) in August 2017. Though solar thermal plants with energy storage can work as stand alone systems, combination with solar PV power can deliver further cheaper power. Cheaper and dispatchable solar thermal storage power need not depend on costly or polluting coal/gas/oil/nuclear based power generation for ensuring stable grid operation. When a solar thermal storage plant is forced to idle due to lack of sunlight locally during cloudy days, it is possible to consume the cheap excess infirm power from solar PV, wind and hydro power plants (similar to a lesser efficient, huge capacity and low cost battery storage system) by heating the hot molten salt to higher temperature for converting the stored thermal energy in to electricity during the peak demand hours when the electricity sale price is profitable. In the windy great plains expanse of the central United States new-construction wind power costs in 2017 are compellingly below costs of continued use of existing coal burning plants. Wind power can be contracted via a power purchase agreement at two cents per kilowatt hour while the operating costs for power generation in existing coal-burning plants remain above three cents. In 2016 the Norwegian Wind Energy Association (NORWEA) estimated the LCoE of a typical Norwegian wind farm at 44 €/MWh, assuming a weighted average cost of capital of 8% and an annual 3,500 full load hours, i.e. a capacity factor of 40%. NORWEA went on to estimate the LCoE of the 1 GW Fosen Vind onshore wind farm which is expected to be operational by 2020 to be as low as 35 €/MWh to 40 €/MWh. In November 2016, Vattenfall won a tender to develop the Kriegers Flak windpark in the Baltic Sea for 49.9 €/MWh, and similar levels were agreed for the Borssele offshore wind farms. As of 2016, this is the lowest projected price for electricity produced using offshore wind. In 2004, wind energy cost a fifth of what it did in the 1980s, and some expected that downward trend to continue as larger multi-megawatt turbines were mass-produced. As of 2012[update] capital costs for wind turbines are substantially lower than 2008–2010 but are still above 2002 levels. A 2011 report from the American Wind Energy Association stated, "Wind's costs have dropped over the past two years, in the range of 5 to 6 cents per kilowatt-hour recently.... about 2 cents cheaper than coal-fired electricity, and more projects were financed through debt arrangements than tax equity structures last year.... winning more mainstream acceptance from Wall Street's banks.... Equipment makers can also deliver products in the same year that they are ordered instead of waiting up to three years as was the case in previous cycles.... 5,600 MW of new installed capacity is under construction in the United States, more than double the number at this point in 2010. 35% of all new power generation built in the United States since 2005 has come from wind, more than new gas and coal plants combined, as power providers are increasingly enticed to wind as a convenient hedge against unpredictable commodity price moves." This cost has additionally reduced as wind turbine technology has improved. There are now longer and lighter wind turbine blades, improvements in turbine performance and increased power generation efficiency. Also, wind project capital and maintenance costs have continued to decline. For example, the wind industry in the USA in 2014 was able to produce more power at lower cost by using taller wind turbines with longer blades, capturing the faster winds at higher elevations. This opened up new opportunities in Indiana, Michigan, and Ohio. The price of power from wind turbines built 300 to 400 ft (91 to 122 m) above the ground can now compete with conventional fossil fuels like coal. Prices have fallen to about 4 cents per kilowatt-hour in some cases and utilities have been increasing the amount of wind energy in their portfolio, saying it is their cheapest option. ^ "Cost of wind, nuclear and gas powered generation in the UK". Claverton-energy.com. Retrieved 2012-09-04. ^ "David Millborrows paper on wind costs". Claverton-energy.com. Retrieved 2012-09-04. ^ a b c d Bronski, Peter (29 May 2014). "You Down With LCOE? Maybe You, But Not Me:Leaving behind the limitations of levelized cost of energy for a better energy metric". RMI Outlet. Rocky Mountain Institute (RMI). Archived from the original on 28 October 2016. Retrieved 28 October 2016. Desirable shifts in how we as a nation and as individual consumers—whether a residential home or commercial real estate property—manage, produce, and consume electricity can actually make LCOE numbers look worse, not better. This is particularly true when considering the influence of energy efficiency...If you’re planning a new, big central power plant, you want to get the best value (i.e., lowest LCOE) possible. For the cost of any given power-generating asset, that comes through maximizing the number of kWh it cranks out over its economic lifetime, which runs exactly counter to the highly cost-effective energy efficiency that has been a driving force behind the country’s flat and even declining electricity demand. On the flip side, planning new big, central power plants without taking continued energy efficiency gains (of which there’s no shortage of opportunity—the February 2014 UNEP Finance Initiative report Commercial Real Estate: Unlocking the energy efficiency retrofit investment opportunity identified a $231–$300 billion annual market by 2020) into account risks overestimating the number of kWh we’d need from them and thus lowballing their LCOE... If I’m a homeowner or business considering purchasing rooftop solar outright, do I care more about the per-unit value (LCOE) or my total out of pocket (lifetime system cost)?...The per-unit value is less important than the thing considered as a whole...LCOE, for example, fails to take into account the time of day during which an asset can produce power, where it can be installed on the grid, and its carbon intensity, among many other variables. That’s why, in addition to [levelized avoided cost of energy (LACE)], utilities and other electricity system stakeholders...have used benefit/cost calculations and/or an asset’s capacity value or contribution to peak on a system or circuit level. ^ US Energy Information Administration, Levelized cost of new generation resources, 28 January 2013. ^ a b "U.S. Energy Information Administration (EIA) – Source". Retrieved 25 November 2016. ^ "Marginal Energy Price Analyses". Energy Efficiency Standards (DOE). ^ a b "Subsidies and costs of EU energy. Project number: DESNL14583" Pages: 52. EcoFys, 10 October 2014. Accessed: 20 October 2014. Size: 70 pages in 2MB. ^ "BBC NEWS – Business – The economic impact of global warming". 2002-10-14. Retrieved 25 November 2016. ^ O'Loughlin, Toni (27 October 2009). "Climate change threatens Australia's coastal lifestyle, report warns". The Guardian. Retrieved 25 November 2016. ^ "Tufts University slide 28, note projected Bangladesh evacuation". Retrieved 25 November 2016. ^ "The Hidden Costs of Fossil Fuels". Retrieved 25 November 2016. ^ "Climate Change Effects – Rising Sea Level in depth". Archived from the original on 21 September 2011. Retrieved 25 November 2016. ^ "Short Sharp Science: Five nations under threat from climate change". Retrieved 25 November 2016. ^ "BBC News – ASIA-PACIFIC – Tiny Pacific nation takes on Australia". 2002-03-04. Retrieved 25 November 2016. ^ Boom, Keely. "See you in court: the rising tide of international climate litigation". Retrieved 25 November 2016. ^ IPCC, Glossary A-D: "Climate price", in IPCC AR4 SYR 2007. ^ Viktor Wesselak, Thomas Schabbach, Thomas Link, Joachim Fischer: Regenerative Energietechnik. Springer 2013, ISBN 978-3-642-24165-9, p. 27. ^ Publications: Vienna Convention on Civil Liability for Nuclear Damage. International Atomic Energy Agency. ^ Nuclear Power's Role in Generating Electricity Congressional Budget Office, May 2008. ^ Methodenkonvention 2.0 zur Schätzung von Umweltkosten B, Anhang B: Best-Practice-Kostensätze für Luftschadstoffe, Verkehr, Strom -und Wärmeerzeugung (PDF; 886 kB). Studie des Umweltbundesamtes (2012). Abgerufen am 23. Oktober 2013. ^ Ökonomische Bewertung von Umweltschäden METHODENKONVENTION 2.0 ZUR SCHÄTZUNG VON UMWELTKOSTEN (PDF; 799 kB), S. 27–29. Studie des Umweltbundesamtes (2012). Abgerufen am 23. Oktober 2013. ^ Externe Kosten der Atomenergie und Reformvorschläge zum Atomhaftungsrecht (PDF; 862 kB), 9/2012. Forum Ökologisch-Soziale Marktwirtschaft e.V. im Auftrag von Greenpeace Energy eG und dem Bundesverband Windenergie e.V. Abgerufen am 23. Oktober 2013. ^ "New Harvard Study Examines Cost of Coal". Environment.harvard.edu. 2011-02-17. Retrieved 2012-09-04. ^ "Levelized Cost of Energy and Levelized Cost of Storage 2018". November 8, 2018. Retrieved November 11, 2018. ^ "Tumbling Costs for Wind, Solar, Batteries Are Squeezing Fossil Fuels". London and New York: Bloomberg New Energy Finance. March 28, 2018. Retrieved July 28, 2018. Latest BNEF study of comparative costs worldwide shows an 18% improvement in the competitiveness of onshore wind and solar in the last year, and new and rapidly developing roles for batteries. ^ "Solar and wind now the cheapest power source says BloombergNEF". London and New York. 1 September 2018. Retrieved 19 November 2018. ^ Renewable Power Generation Costs in 2017. Abu Dhabi: International Renewable Energy Agency (IRENA). January 2018. ISBN 978-92-9260-040-2. Retrieved June 14, 2018. The trend is clear: by 2020, all mainstream renewable power generation technologies can be expected to provide average costs at the lower end of the fossil-fuel cost range. In addition, several solar PV and wind power projects will provide some of the lowest-cost electricity from any source. ^ "EBRD says renewables are now cheapest energy source". October 2018. ^ CIVIL SOCIETY TOWNHALL 2018. October 2018. ^ "The Australian Energy Technology Assessment (AETA) 2012". Office of the Chief Economist. Bureau of Resources and Energy Economics (BREE). Retrieved 28 October 2016. ^ "One simple chart shows why an energy revolution is coming — and who is likely to come out on top". Business Insider France (in French). Retrieved 2018-10-17. ^ a b c "Studie: Stromgestehungskosten erneuerbare Energien - März 2018". Fraunhofer ISE. 2018. Retrieved 2 April 2018. ^ a b "Levelized cost of electricity renewable energy technologies" (PDF). Fraunhofer ISE. 2013. Retrieved 6 May 2014. ^ Johnston, Eric, "Son's quest for sun, wind has nuclear interests wary", Japan Times, 12 July 2011, p. 3. ^ Bird, Winifred, "Powering Japan's future", Japan Times, 24 July 2011, p. 7. ^ "Institution of Engineers and Shipbuilders in Scotland report" (PDF). Retrieved 2012-09-04. ^ "Institution of Engineers and Shipbuilders in Scotland data". Iesisenergy.org. Retrieved 2012-09-04. ^ Carsten Volkery: Kooperation mit China: Großbritannien baut erstes Atomkraftwerk seit Jahrzehnten, In: Spiegel Online vom 21. Oktober 2013. ^ "ELECTRICITY GENERATION COSTS" (PDF). www.gov.uk. BEIS. November 2016. Retrieved 6 December 2016. ^ "UK nuclear power plant gets go-ahead". BBC News. 21 October 2013. ^ Roland Gribben and Denise Roland (21 October 2013). "Hinkley Point nuclear power plant to create 25,000 jobs, says Cameron". London: Daily Telegraph. ^ "U.S. Energy Information Administration (EIA) – Source". www.eia.gov. Retrieved 2015-11-02. ^ "New Report: Renewable Energy and Energy Efficiency Will Grow, Provide Options for Clean Power Plan Compliance Based on Cost Competitiveness—Official Projections Fail to Capture Market Realities, Skewing Policy Considerations". PR newswire. 22 June 2015. ^ Levelized cost and levelized avoided cost of new generation resources, US Energy Information Administration, Annual Energy Audit 2016, 5 August 2016. ^ Levelized cost and levelized avoided cost of new generation resources, US Energy Information Administration, Annual Energy Outlook 2017, April 2017. ^ Levelized cost and levelized avoided cost of new generation resources, US Energy Information Administration, Annual Energy Outlook 2018, March 2018. ^ OpenEI Transparent Cost Database. Accessed 06/19/2015. ^ "Lazard Press Release" (PDF). Lazard. 2016-12-16. Retrieved 2017-11-06. ^ "Lazard's Levelized Cost of Energy Analysis - Version 11.0" (PDF). Lazard. 2017-11-02. Retrieved 2017-11-04. ^ a b c "Lazard's Levelized Cost of Storage Analysis - Version 3.0" (PDF). Lazard. 2017-11-02. Retrieved 2017-11-04. ^ "Lazard Press Release November 2, 2017" (PDF). Lazard. 2017-11-02. Retrieved 2017-11-04. ^ "MESIA und DEWA melden Rekordgebot bei Photovoltaik-Ausschreibung: 0,0299 USD/kWh Solarstrom" (in German). solarserver.de. 2016-05-01. p. 1. Retrieved 2016-05-11. ^ "Sun, wind and drain". The Economist. 26 July 2014. Retrieved 25 November 2016. 2 emission of electricity generation: The Brazilian case". Energy Conversion and Management. 85: 619–629. doi:10.1016/j.enconman.2014.04.058. ^ "Solar Photovoltaics Competing in the Energy Sector—On the road to competitiveness" (PDF). European Photovoltaic Industry Association. September 2011. p. 18. Archived from the original (PDF) on February 26, 2013. Retrieved March 11, 2015. ^ "Price Quotes". Retrieved 23 August 2017. ^ "Sunny Uplands: Alternative energy will no longer be alternative". The Economist. 21 November 2012. Retrieved 2012-12-28. ^ "Utilities' Honest Assessment of Solar in the Electricity Supply". Retrieved 25 November 2016. ^ "Renewables Investment Breaks Records". Renewable Energy World. 29 August 2011. ^ Renewable energy costs drop in '09 Reuters, November 23, 2009. ^ Solar Power 50% Cheaper By Year End – Analysis Reuters, November 24, 2009. ^ Arno Harris (31 August 2011). "A Silver Lining in Declining Solar Prices". Renewable Energy World. ^ "NV Energy buys utility-scale solar at record low price under 4 cents/kWh". Retrieved 23 July 2015. ^ EcoWatch (22 August 2016). "Great news!". Retrieved 25 November 2016. ^ "UPDATE – Abu Dhabi confirms USD 24.2/MWh bid in solar tender – SeeNews Renewables". Retrieved 25 November 2016. ^ ""The Birth of a New Era in Solar PV" — Record Low Cost On Saudi Solar Project Bid". Retrieved 7 October 2017. ^ John Quiggin (January 3, 2012). "The End of the Nuclear Renaissance |". National Interest. ^ Osborne, Mark (2016-11-10). "SolarEdge sales slow on US residential market sluggishness". pv-tech.org. Retrieved 2016-12-09. ^ Mundada, Aishwarya; Shah, Kunal; Pearce, Joshua M. (2016). "Levelized cost of electricity for solar photovoltaic, battery and cogen hybrid systems". Renewable and Sustainable Energy Reviews. 57: 692–703. doi:10.1016/j.rser.2015.12.084. ^ Shah, Kunal K.; Mundada, Aishwarya S.; Pearce, Joshua M. (2015). "Performance of U.S. hybrid distributed energy systems: Solar photovoltaic, battery and combined heat and power". Energy Conversion and Management. 105: 71–80. doi:10.1016/j.enconman.2015.07.048. ^ "Solar Reserve awarded AU$78/MWh Concentrated Solar Power contract". Retrieved 23 August 2017. ^ "Aurora: What you should know about Port Augusta's solar power-tower". Retrieved 22 August 2017. ^ "Dispatchable Concentrated Solar Power Broke Price Records in 2017". Retrieved 22 September 2017. ^ "UAE's push on concentrated solar power should open eyes across world". Retrieved 26 September 2017. ^ "Salt, silicon or graphite: energy storage goes beyond lithium ion batteries". Retrieved 1 September 2017. ^ "Commercializing Standalone Thermal Energy Storage". Retrieved 1 September 2017. ^ "Europe's biggest and cheapest onshore wind project". norwea.no. 2016-06-07. Retrieved 2016-08-21. ^ "Vattenfall wins tender to build the largest wind farm in the Nordics". corporate.vattenfall.com. Retrieved 17 November 2016. ^ "LBNL/NREL Analysis Predicts Record Low LCOE for Wind Energy in 2012–2013". US Department of Energy Wind Program Newsletter. 24 February 2012. Archived from the original on 5 March 2012. Retrieved 10 March 2012.